Valentine’s Day would not be complete without some rich decadent chocolate cake. 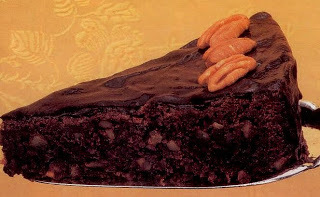 This cake is one of our absolute favorites and sure to please any chocoholic! Enjoy! Line bottom of 9″ springform pan with aluminum foil; butter foil and side of pan. Set aside. after each addition. Blend in cocoa, flour, oil and water; beat well. Beat egg whites, cream of tartar and salt in small mixer bowl until stiff peaks form. Carefully fold into chocolate mixture. center.) Cool 1 hour. Cover; chill until firm. Remove side of pan. This entry was posted in Uncategorized and tagged Dessert Recipes by Debbie Reynolds. Bookmark the permalink.